Roma - Morning temperatures will be around 14 °C. During the day they will reach a maximum of 20 °C. 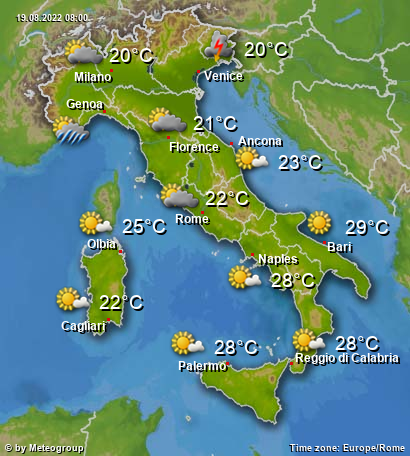 On Meteoallerta you will find current weather data, local weather forecasts and a treasure of useful information around weather. Thanks to our current severe weather warnings there will be no nasty surprise any more. The Italian climate is characterized by its north-south extension, as well as by the surrounding Mediterranean Sea and the mountains. The average annual temperature is 11° C in the north and 19° C in the south. The most distinctive difference regarding the annual precipitation is observed between coastal areas and mountain regions. With about 750 liters of precipitation per square meter the capital Rome features a representative mean value for Italy. Despite similar annual precipitation amounts, the number of arid months increases when moving from north to south. In consequence of the southward shift of the frontal zone, precipitation is especially falling in the fall and winter months. Due to the orography heavy rain and floodings are no rarity in Italy. Mountain climate is dominating in the Alps and in the higher regions of the Apennines. The winter is cold and often snowy, the summer is mild. The highest, as well as the lowest annual precipitation amounts of Italy can be found in the Alps. Up to 3000 liters per square meter can be expected along the pre-Alps of the Friuli region as opposed to 500 liters per square meter in the inner alpine dry valleys of Val Venosta in the region of South Tyrol. Just as little precipitation is observed in Sicily, which is why grain growing is possible. Through prevailing west winds clearly more precipitation is falling at the western (windward) than at the eastern slopes (leeward) of the Apennines. Seasonal differences in temperature are high in the Po Valley, which is typical for a temperate continental climate. Summer is hot and muggy, winter is dank. Surrounded by the Alps and the Apennines atmospheric inversions with cold air close to the surface and dense low stratus are often formed in the Po Valley, which leads to high concentration in airborne pollutants. The influence of the Ligurian Sea and the Tyrrhenian Sea, both parts of the Mediterranean Sea, is clearly noticeable along the coastlines and on the islands. Winter is mild and during the summer period extreme heat is mitigated by cooling sea breezes. Located on the same latitude the climate of the Adriatic Coast is somewhat cooler. Wind from northeast (Bora) can cause a clear cool-off in this region any time of the year. The south of Italy and Sicily are one of the warmest and driest regions in Europe. The warm period already starts in the beginning of February and ends often in November. During the long summer period from May till September nature is often suffering drought. At the same time heat events with temperatures about 40° C will not infrequently be the case, for which the Sirocco, a Mediterranean wind coming from the Sahara, can be jointly responsible. During winter period the North Atlantic High is shifting westward and clears the way for Mediterranean lows, which may cause abundant precipitations and thunderstorms.